It's finally Spring time and nothing says spring like a nice bottle of rosé. 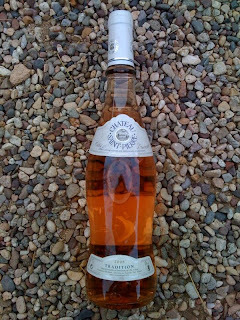 Last week we went to Joshua Tree for my birthday and took a few bottles of rosé with us, this guy to the right, the Chateau Saint Pierre 2008 Cotes-de-Provence Rose, was particularly pleasant. In general, the rosés from Provence tend to be a bit lighter in both flavor and color. They are crisp and refreshing and great with grilled seafood and garlicy sauces. We drank the Chateau Saint Pierre with oysters on the half shell filled with butter and garlic. It was perfect! And, at around $14 it tastes as elegant as some rosés twice the price. It is light with a softly perfumey nose and crisp tart fruit. A great way to celebrate spring!